The main thing I learned this week? That they don't make dishwashers like they used to!! I'm joining up with Jo-Lynne at Musings of a Housewife today to share the learning! If you've learned anything lately (oh I'm SURE you have) then post about it and link it up at Jo-Lynne's place on Tuesdays! The night before Christmas Eve the dishwasher made a loud pop and wouldn't wash. It would fill and drain but no washing. UGH. No dishwasher for Christmas Eve or Christmas Day. A kind brother-in-law actually washed the dinner dishes for me both days - thanks! Hubs called about the dishwasher on Christmas Eve, was referred to a warranty repair line and finally got an appointment - for JANUARY 4. That day the repairman came and informed us that our motor wasn't working (hello - stating the obvious). He had to order from the manufacturer and it would be in in 2 weeks and then he'd schedule an appointment. Finally, on January 20th (I KNOW), the new motor was installed. I happily used the dishwasher with no problems! A couple days later I started it up to run again, but it seemed to stay in the wash cycle for a very long time and then we started to smell burning plastic. Yikes! Wasn't coming from the motor or where the dishes were. We narrowed it down to where the control panel is housed. Looked online to discover several complaints of melted control panels and even fires! Hubs called and of course had to call warranty repairs. Got an appointment...for FEBRUARY 8! So, guy came yesterday and said yeah, sounds like the control panel and it'll take 3-4 weeks to come in. What??? Repair guy informed hubs that maybe he should consider returning it and spending more to get a different one. Hubs had already called the store to try and return but they had said no because it had been past 30 days - told us we'd have to go through the manufacturer. Repair guy got hubs sufficiently motivated to give it a shot. Hubs uninstalled the dishwasher, took it to the store along with receipts and repair records. He firmly but graciously asked them to do the stand-up thing and accept the return and that we'd actually spend more money to buy a better dishwasher. Hubs would even take it and install it, saving them delivery hassles, etc. They eventually said YES! Woo Hoo! So now there is a better (hopefully) dishwasher installed and I'll be trying it out this evening. ~ Repair places are not motivated to do warranty repairs quickly - expect long time-frames for your appointments. ~ Don't buy the cheapest dishwashers or the most expensive ones. Somewhere in the middle is the best value. ~ Don't be afraid to go and talk to a manager about making an exception for you. YOU spent the money! Remember - they are more likely to work with you if you speak respectfully rather than in an angry manner. ~ Buy the extended warranty for refrigerators and dishwashers as they have the most problems. Sadly I saw complaints online about every make and model of dishwasher (no matter the price) with many issues showing up after 2 years. ~ They don't make dishwashers like they used to. Our old one was still running after 19 years. This new one? I'll be very surprised if it's still around in 10. How old is your dishwasher? 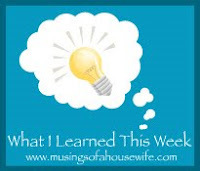 Now be sure to stop at Musings of a Housewife to see what everybody else learned this week! We had a terrible time with our refrigerator--We had purchased the extended warranty from Sears. The refrigerator was installed and working fine until one day we heard "shizipp and spark and then smelled something burning. It was our ice maker that had shorted out. It shorted the whole entire refrigerator and we couldn't use it. It took them a month to get the part. They stuck it in and no sooner had the repair guy said done and turned the power on that we heard the same horrible noise as before and blip the refrigerator was not working again. The repair man didn't know what to do called his boss and his boss said to tell us that they would order another part. Well I was not happy--I went to the store and spoke directly to the store manager--they came the next day and took our refrigerator and brought us an upgraded one at no extra cost. Which was good as I was out of a refrigerator for a month. Thank God it was during the winter and I could put my things in coolers on the back porch to keep things cold. I was complaining about my dishwasher not working well. My friend was having the same problem. She even had a repairman come and look at hers. He told her to only fill the detergent cap half full and use Cascade. It did the trick for both of us! Go figure! we are dealing with a dishwasher issue here. Its not working the best , but we know we need new ones too. Glad to know that it all worked out for you. That's a hard lesson! I can't stand waiting for repairmen. We've had a cheap Frigidaire for years now and it's still going strong. Granted it only gets used about 4 times a year because we like to hand wash stuff but it does a great job those 4 times! LOL! Big just wear gloves and you won't get pruney fingers size hugs to you! Thanks, that was some advise I could use. My dishwasher is on the fritz! Good story. I'm glad you guys stood your ground! I have 2 dishwashers -- they're 16 and 17 years old -- and they don't always clean the dishes well --- and they complain sometimes while they're doing it. I've been following your blog for awhile and I wanted to say that I just love your blog. You are such an inspiration. Thank you for being who you are. Ugh! How frustrating! I hope your new dishwasher does much better. We've been fortunate. We bought ours when we moved into our house 7 years ago and haven't had any problems with it. Well other than it leaking every once in a while. But hubby seems to have taken care of that. Thank goodness! Oh my gosh, what an ordeal! So frustrating I'm sure. I hope your new dishwasher is all you hope for and more. Keep us posted. By the way, when did you get a new header? I love it!!! Very chocolatey and very you.